A few years ago, while conducting research for a course I was developing as a freelancer, I discovered the science of positive psychology (if you don’t know anything about it, watch this great 5-minute whiteboard video). Traditional psychology typically looks at what is wrong with us, while positive psychology looks at what is right with us. Our strengths are as important as weaknesses. I was fascinated by this evidence-based science and pondered how I could apply it to second language acquisition. 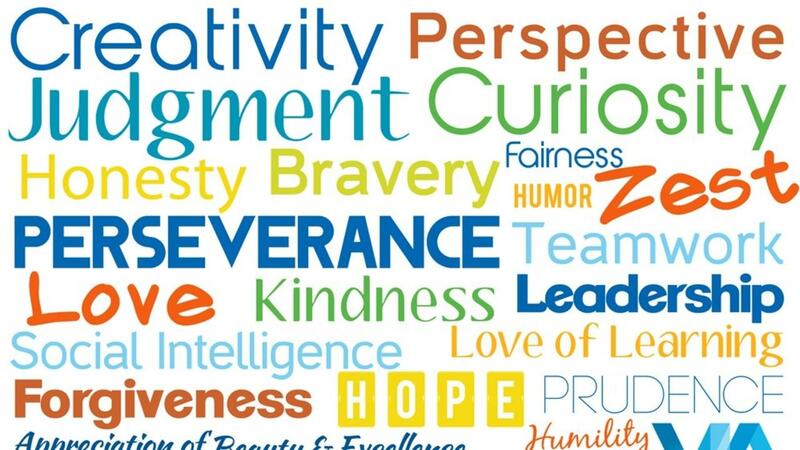 I feel that one of the most interesting areas in positive psychology is exploring character strengths (some examples include honesty, zest, love of learning, perseverance, gratitude, and curiosity). Approximately 55 scientists reviewed the best thinking on virtues and positive human qualities in the areas of theology, psychology, and philosophy from the past 2,500 years over a three-year period. The result was a compilation of 24 character strengths which are universal across religions, cultures, nations, and belief systems. I liked the idea of focusing on students’ strengths instead of their weaknesses, because after seven years as an EAP instructor I felt that with red pen in hand, my job was to point out errors or deficits in writing. And students are much more than their writing skills! I decided to use the character strengths survey with my students in hopes to motivate them more but had no idea how big the impact of taking a 10-minute survey would be. Below I’d like to list the steps my class and I took in using character strengths in an EAP class. The survey. The character strengths survey takes about 10 minutes and is available at http://www.viacharacter.org/www/Character-Strengths-Survey. I set up a free teacher account on the website with a designated link for the survey for each class. In this way I could get the survey results emailed to me and I could also verify that the students did actually complete the survey. Face-to-face interviews. I set up a schedule with 10-minute time slots to talk to students about their top five character strengths and how they use them specifically as a student. I created a form for this task which they were required to complete and bring to the interview. Reflecting on the survey results before the interview and being asked questions during the interview was part of a pre-writing exercise for their writing assignment. Writing assignment. Students were required to write a 5-paragraph essay about their top three character strengths. Although the top five are considered Signature Strengths (and the ones that are most easily and often used), choosing just three made it easier for the essay format. Meeting forty students in one class requires time that we often do not have but I wanted to be able to personally connect with each student. During the interviews, I noticed two things. First, when I asked each student to tell me about their top five character strengths and how they demonstrate them as a student, they immediately came to life! Normally in my EAP classes students are very quiet, but the same learners beamed and spoke with a sense of excitement as they talked about their strengths. The second change was in me. When I looked out at the sea of student's faces after the interviews, I saw their strengths instead of thinking about their writing skills. For example, I had one student who constantly asked questions. When I learned that two of his top five strengths were curiosity and leadership, it made complete sense. In other words, instead of seeing him as annoying I now perceived him as inquisitive and asking questions that others might be afraid to ask. Another student, who had hounded me via email for two weeks about making up a missed assignment, had fairness as his top strength. He felt that my denial of his request was unfair and that made sense to me, so we talked one day after class and I changed my mind about the make-up test. Normally I can’t say that I enjoy reading and grading forty essays, but I was actually excited about reading that particular pile of papers. Students had learned what they were good at and what was positive about themselves. Hopefully, this knowledge and awareness will have a lasting effect on their success as learners and out in the labour force. I’d like to share with you a few comments from the essays written by my students. There are many reasons why it could be a good idea, but I think most importantly students should learn about their strengths and reflect on how they can use them (or how they have been using them in the past) to achieve results inside and outside of school. We know that our language learners can feel frustrated in their ability to learn English, so focusing on strengths could give them confidence. It is important to remember that all character strengths have downsides if overused, so that should be discussed as well. For example, my own top character strength is Appreciation for Beauty and Excellence but its overuse results in perfectionism! Another example would be the overuse of curiosity – too much of it may mean that the person never gets anything done because they are so distracted by learning about everything around them. Overall, using our character strengths makes us feel happier, more confident, increases our energy, lessens our stress, helps us to achieve goals and grow as individuals. What teacher doesn’t want that for his/her students!